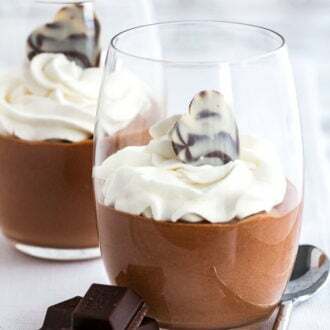 This easy Chocolate Mousse recipe is super simple to make from scratch and deliciously light and fluffy. It's fancy enough for a party but easy enough to make whenever you have a craving for chocolate! An eggless mousse recipe that is so airy and chocolatey and can be enjoyed by everyone. In a small saucepan, bring 1 cup of the heavy cream to a bare simmer. Pour the cream over the chopped chocolate, let sit for 1 minute. Add vanilla extract and a pinch of salt, then whisk until smooth. Cover and chill in the fridge for about 20 minutes to cool. Beat 2 cups heavy cream and powdered sugar in a medium bowl with a hand mixer or stand mixer on medium-high speed to stiff peaks, about 3 minutes. Put 1/2 of the whipped cream in a container and store in the fridge until needed for decorating. Give the chocolate mixture a whisk then fold it into the remaining whipped cream with a silicone spatula until no streaks remain. Distribute between glasses or bowls and cover with plastic wrap. Refrigerate for at least 6 hours or overnight.